I told my friend Tabitha that I would read Beautiful Music for Ugly Children ages ago. Went as far as to check it out from the library (and then let the electronic borrow expire before I got to it). When we went to Portland in January, she brought along her copy, which she promptly handed to me after our roundtable discussion. It wasn’t until I did a Friday 56 (a few weeks ago) that I really felt the need to read it. It’s a band thing. But now that I have, I’m quite happy I did and will (hopefully) be adding this novel to my collection soon. 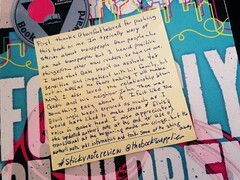 In case you can’t read this (because the writing is ridiculously small), here’s the video for my Sticky Note Review. Happy reading!